Ultrawideband (UWB) radios are extremely wideband radios with very high potential data rates. The concept of ultrawideband communications actually originated with Marconi’s spark gap transmitter, which occupied a very wide bandwidth.However,since only a single low-rate user could occupy the spectrum, wideband communications was abandoned in favor of more efficient communication techniques. The renewed interest in wideband communications was spurred by the FCC’s decision in 2002 to allow operation of UWD devices as system underlayed beneath existing users over a 7GHz range of frequencies .These system can operate either at baseband or at a carrier frequency in the 3.6-10.1 GHz range. The underlay in theory interferes with all systems in that frequency range, including critical safety and military systems, unlicensed systems such as 802.11 wireless and Bluetooth, and cellular systems where operators paid billions of dollars for dedicated spectrum use. The FCC’s ruling was quite controversial given the vested interest in interference-free spectrum of these users. To minimize the impact of UWB on primary band users, the FCC put in place server transmit power restrictions. 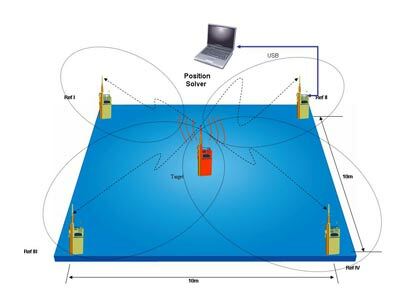 This requires UWB devices to be within close proximity of their intended receiver. UWB radios come with unique advantages that have long been appreciated by the radar and communications communities. Their wideband nature allows UWB signals to easily penetrate through obstacles and provides very precise ranging capabilities.Moreover,the available UWB bandwidth has the potential for very high data rates.Finally,the power restrictions dictate that the devices can be small with low power consumption. Initial UWB systems used ultra-short pulses with simple amplitude or position modulation. Multipath can significantly degrade performance of such systems, and proposals to mitigate the effects of multipath include equalization and multicarrier modulation. Precise and rapid synchronization is also big challenge for these systems. While many technical challenges remain, the appeal of UWB technology has sparked great interest both commercially and in research community to address these issues.